In the above tail, I enabled a Windows 7′s network adapter (from previously disabled) and it would soon try to HTTP GET the wpad.dat even when no browser opened yet. 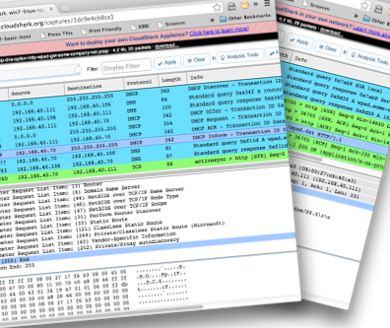 From testing with Windows XP, Windows 7, and Ubuntu (with different browsers mostly), DHCP Inform‘s WPAD behavior can be seen with Windows 7 test by analyzing the packet going out after some time since the initial DHCP stream (check the packet capture for 7 seconds after DHCP Discover). It asked for WPAD in one of the Parameter Request List Item (apply the filter bootp.option.request_list_item == 252 for a closer look), but received no answer. 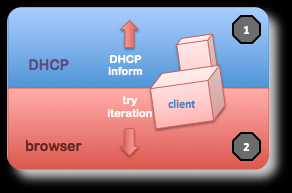 I failed to reproduce other samples of DHCP Inform packet asking for WPAD. Hence, for the rest, it’s the browser who is doing the GET to http://wpad.some-company.net/wpad.dat with DHCP only supplied domain name instead of complete WPAD (check another packet capture, this time for Ubuntu with Firefox 20). The GET attempt isn’t actually one shot attempt. When it fails to find the wpad.dat in http://wpad.some-company.net/wpad.dat, it should iteratively try to find within the higher domain e.g. http://some-company.net/wpad.dat. DHCP server configuration used, wpad.dat file example (I simply use symbolic link to proxy.pac), and Apache2 VirtualHost config are available in my github, an attempt to integrate Squid3 cache with WPAD, PAC, and DHCP. 192.168.40.78 - - [30/Apr/2013:16:20:39 +0700] "GET /wpad.dat/ HTTP/1.1" 404 478 "-" "Mozilla/4.0 (compatible; MSIE 6.0; Win32)"
192.168.40.78 - - [30/Apr/2013:16:28:07 +0700] "GET /wpad.dat/ HTTP/1.1" 404 478 "-" "Mozilla/4.0 (compatible; MSIE 6.0; Win32)"
192.168.40.77 - - [01/May/2013:20:07:24 +0700] "GET /wpad.dat/? HTTP/1.1" 404 534 "-" "-"
I was able to force it to GET the correct WPAD value by adding new network adapter which received different IP lease from DHCP server. Afterwards, connecting with the old adapter will also keep correct behavior. I still don’t know how they keep the previously incorrect behavior. In short we can’t rely on WPAD alone, but there is probability that some portions of the network clients will find the proxy this way, automatically without technical assistance.